I would like to define a cybernetic novel as one that writes itself, or one where the reader is also the narrator. A novel that possesses self-reflexivity. 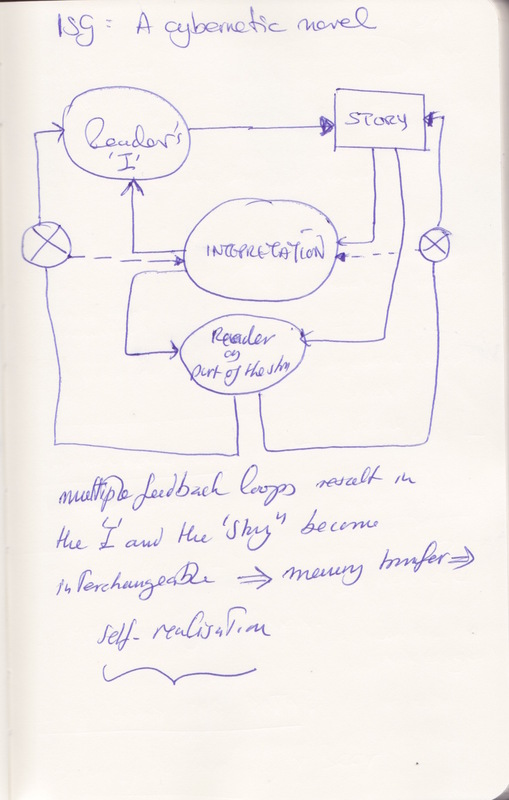 I made the sketch (see above) some time ago while thinking about my novel “The Island Survival Guide“. When I say “I thought about my novel” I mean as a reader, not as a writer. In fact, cybernetic writing blurs the distinction between writer and reader, and finally break it down completely: the writer is the reader who is the writer, and so on. As it does so it also undermines and destroys a more significant dichotomy, the difference between the narrative (object) and the narrator/reader (subject). The two become one, one reflecting into the other. This is of course a logical paradox. 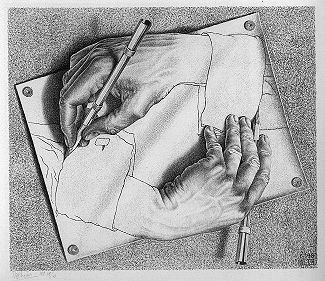 Cybernetic writing is a logical paradox based on reflexivity. The paradox of narrative reflexivity that defines a cybernetic novel is what makes it what it is; it is a paradox that creates an escape hatch, or a quantum wormhole, connecting two different universes that exist in different dimensions. The mind is free to travel between these two narrative universes. As it travels it transfers experiences and knowledge between the two universes. Thus, the paradox of narrative reflexivity becomes the act of creation. The novel is created as a dialogue between the 3-dimensional (+time) universe of the narrator/reader/writer (the terms cease to have distinct meaning in a reflexive narrative context) and the multi-dimensional universe of the novel. As old meaning breaks down because of continuous feedback between the narrator and the narrative, new meaning is created. The Island Survival Guide was my second experiment in writing a cybernetic novel (my first being The Secrets of the Lands Without).